There are lots of benefits to exercise and physical activity. Many of my patients complain that they do not have the time to exercise. We get it, life is busy! There are lots of options, but I personally frequently recommend a simple daily exercise routine. It takes 7 minutes. Everyone has 7 minutes a day! You probably spend more time in a day watching TV or scrolling through Facebook. 49 minutes per week of exercising is better than 0. All you need is a chair. Do them first thing in the morning. Do them on your lunch break. Do them just before the long commute home. You can do them in your suit. You can do them in your pajamas. You can do these exercises anywhere. Check out this article from The New York Times on the The 7-minute workout. There is even an app that you can put on your phone. 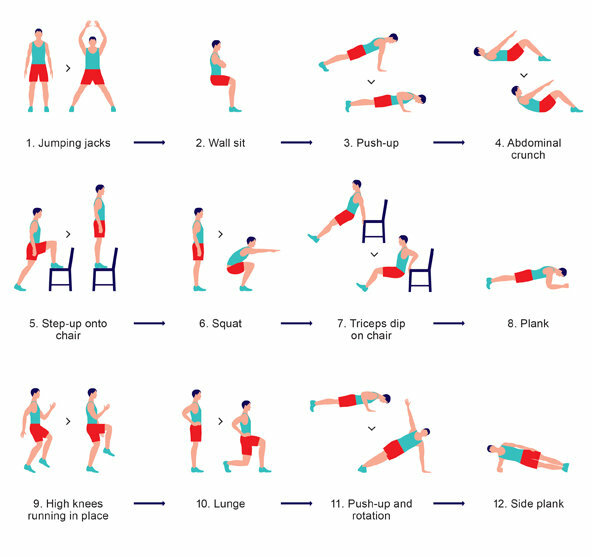 There is also The Advanced 7-minute workout if you get bored and want something more challenging.